HOUSTON - You’re driving in Houston, you’re late for work and you notice a Yellow Cab parked on the side of the -- wait!! What!?!?! HPD!?!? Relax folks!!! 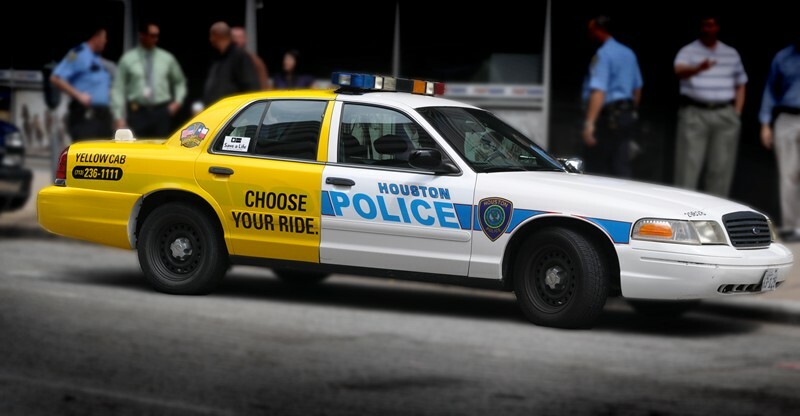 It’s not a conspiracy…it’s a partnership between Yellow Cab and the Houston Police Department, marketing their “Choose Your Ride” campaign. “We had the car for not even like two days and we were driving it on the freeway, and then I got on Facebook and there was like a viral picture of us driving on the freeway saying that HPD is trying to trick people. That’s not what it's about man. This is for the civilians of Houston’s benefit, we’re trying to deter you from drinking and driving. We’re not trying to trick you into thinking we’re driving cabs so that you speed past us and then we pull you over for speeding,” says Officer Jeremy Lahar with HPD. Well that’s a relief. In fact, they take their one and only - half Yellow Cab, half HPD cruiser- to special events like this one in south Houston. “The Houston Police Department is partnering up with ABC Dental...and we’re out here giving away backpacks and schools supplies to the kids that are going back to school,” explained E.J. Joseph, also with HPD. The hybrid car serves as a reminder to Houstonians - if you're out on the town throwing a few back, you have a choice. Either plan your ride -- or end up in the back of a cop car. Now, if the unintended consequence is Houstonians slowing down when they see a Yellow Cab, is that necessarily a bad thing?